Beans are a rich source of protein for the vegetarian diet. If you have difficulties digesting beans, the best thing to do is sprout them. 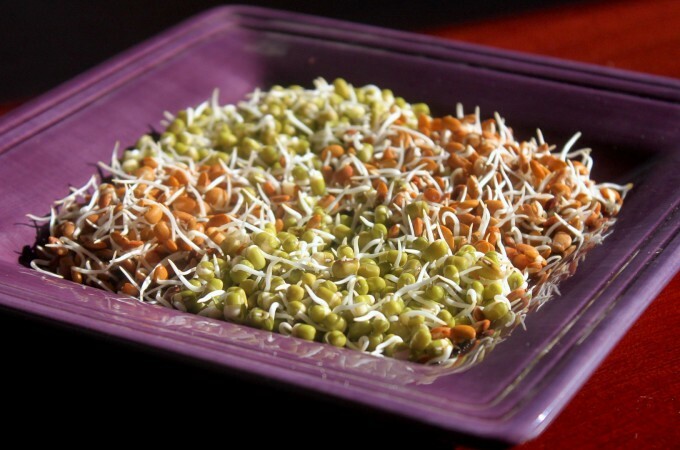 According to studies and research, sprouting is a good choice for people with sensitive gut. Sprouting seeds/legumes helps to breakdown the complex sugars, which in turn reduces the intestinal gas, helping us digest them easier. It is not at all hard to sprout the beans at home. Four easy steps- wash, soak, drain and keep for sprouting. All are 2 to 3 minutes work and end up with enjoying the at home sprouted healthy mung beans. To know more about sprouts and benefits please read the article “Sprouts – Panacea for many ills” by Dr.Shivashankar. It’s a healthy staple to add to a quick vegan dinner.